Must call Front Desk to Reserve. No Online Reservations for Rose Parade Accepted. No execptions. RESERVATIONS MUST BE MADE BY PHONE ONLy. No Online Reservations will be accepted FOR ROSE PARADE, no execptions. The following rates will apply for reservations from December 30, 2018 through and including the night of January 1, 2019. We are offering two night packages only which and 3rd nite only half off. All rates listed are per night (taxes not included) and a minimum stay of two nights is required. ONE PARKING SPACE PER ROOM and NO RV'S ALLOWED OR TRAILERS. We strive at making your stay a memorable time, however during this period, please be aware there will be an elevated noise level and WE WILL NOT GUARANTEE any room to be quiet during your stay. All reservations must be paid in advance by credit card. Checks will NOT be accepted for payment. No cancellations accepted after December 10, 2019. 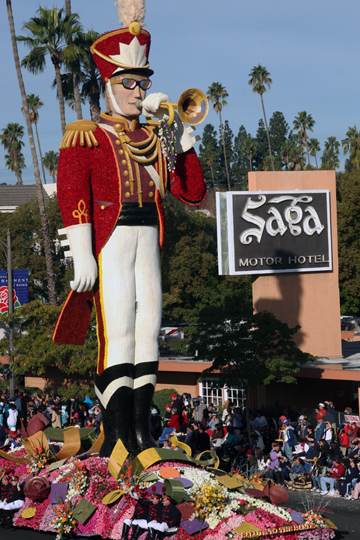 THE ROSE PARADE PASSES DIRECTLY IN FRONT OF THE SAGA MOTOR HOTEL. Call "Sharp Seating" at 626-795-4171 to purchase grand stand-seating tickets. Parking is limited to one car per reservations only. No motorhomes nor trailers will be allowed to park. All car(s) will be registered by the front desk along with a parking pass.